Founded in 1995, Fanatics has an inventory of more than 60,000 officially licensed products for more than 400 college and professional teams (including football, basketball, baseball, soccer and hockey), including jerseys, T-shirts, sweatshirts, caps, auto accessories, blankets, collectibles, cups and glasses, flags and bannders, tailgate equipment, jackets, lawn and garden products, license plate frames, luggage, pet supplies, polos, shoes and socks, wallets and checkbooks and watches and clocks. Use the pulldown menus to find your favorite college or pro team. Don't overlook the sale department. Categories: College, NFL, MLB, NBA, NHL, NASCAR, Soccer, Olympics, MMA, Arena Football, Outlet. Returns: 90 days with receipt and items in original condition, including tags and labels. Sales Tax: Florida. Shipping: $3.99 for three-day shipping to addresses in the continental U.S. Shipping to Hawaii, Alaska and Puerto Rico is $14.95 per order. Shipping to Canada is $18.95 per order. 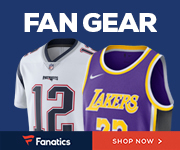 Want free e-mail alerts for Fanatics coupons and deals?